The Academy of Ukrainian Press (AUP) conducted research of prime–time news (19:00-23:00) covered by seven leading Ukrainian TV channels: ‘Inter’, ‘1+1’, ‘Ukraiina’, ‘STB’, ‘ICTV’, ‘UA: The First’ and ‘Channel 5’ based on the content analysis method with the participation of scientists from the Institute of Sociology, National Academy of Science of Ukraine. According to AUP, political news in Ukraine is featured in 26% of all television news content compared to the results of monitoring held in Sep. 2017 that made 33% percent and in Feb. 2017 when it was 40%. This percentage is the lowest since December 2013. Inter devoted the most airtime to political topics, namely, 33% of news reporting, whereas UA: The First was the least inclined to cover political events during the monitoring period providing 20% of airtime to them. The share of broadcast reporting with multiple opinions on general and political events remains stable and has 15% of coverage. News which refer to Facebook and Twitter as sources provide multiple opinions somewhat more frequently, namely, in 20% of all coverage. The share of reportages on the topic of countering corruption remains fairly the same as in the previous year and received 6% of coverage when, according to the AUP’s monitoring, in September, 2017 it was 5%. So, this percentage fell down comparing to the monitoring data collected earlier as it was 12% in June, 2016 and 13% in September, 2015. The Normandy peace negotiation format was almost not addressed in news like it was in the previous year. However, the perspectives of bringing UN peacekeepers to control the situation are discussed from time to time. The share of direct speech given to the opposition representatives grew significantly up to 27% when in September, 2017 it was 13%. “Ukraiina” TV channel provided the most part of direct speech to opposition. However, AUP continues to monitor the tendency of providing more broadcast airtime to the ruling coalition by Ukrainian TV channels. Political loyalty to different powers is steadily demonstrated at the news programs of Ukrainian TV channels. Reliability. According to the AUP, in February, 2018, 57% of all information sources used by researched Ukrainian TV channels originated from resident correspondents (typically more reliable information). In February, 2017 this percentage was lower – 52%. 1+1 TV channel managed to use the most of such sources, 73% out of all. 42% of references made by journalists cited official sources, when in February, 2017 this percentage was 46%. News with referencing to Facebook and Twitter (typically not reliable information) received 9% of television reporting that is lower than 12% fixed in September, 2017. STB TV channel was found to source these social media most often. Separating Facts from Commentary. The standard of separating facts from commentary was frequently broken by “news from views” from Ukrainian television. The commentary reported by journalists on air, according to AUP, made 31% of broadcast time (1+1 TV channel contained the most of it, 47%). At the same time, experts’ commentary received only 28% of opinion reporting. UA: The First looks the best according to this percentage giving 40% of commentary to experts and 19% to journalists. Balance. According to the AUP, 15% of news with multiple opinions was observed in February, 2018 that is quite similar to the situation in previous years. STB focused the most airtime to such news – 25% of reporting. The outliers were Inter and Channel 5 as these TV channel reported less than all news with multiple opinions – 9% of coverage. In about 14% of cases two opinions were expressed in political news, however, this percentage is lower than in the previous year as 16% was fixed in September, 2017 and 17% – in May, 2017. The most of such cases was shown by UA: The First (33%) and the least – by “Ukraiina” (3%). The share of broadcast news including multiple opinions while covering scandal and sensitive events is growing. For example, broadcasts about the “Law on Institute of National Remembrance” adopted by the Polish Sejm contained 41% of multiple opinions, in particular, 100% provided by 1+1 and UA: The First TV channels, but Channel 5 featured only one opinion on this matter. According to AUP’s monitoring in February 2018, Ukrainian conflict participants are more frequently labeled as ‘military people’ – 12% percent of television broadcast time – and, 4% of stories covering the Donbas conflict referred to Ukrainians as ‘those (who) suffered in ATO zone’. Ukraine’s enemies in the Donbas were labeled as ‘terrorists’, and ‘militants’ in 8% of broadcast coverage; and the ‘enemy’ or ‘aggressor’ in 6%. Political Actors. Among the politicians, the most attention was given to P. Poroshenko, President of Ukraine who received 8% of coverage; 6% went to A. Parubii, the Verkhovna Rada, Chairman and V. Groysman, Prime Minister of Ukraine each. The most negative tone of coverage was referred to former Ukraine’s politicians: S. Arbuzov, ex Deputy Prime Minister who received 86% of ironic and negative assessments; 77% of such evaluations went to former disgraced President, V. Yanukovych. Regarding the current political actors, the most ironic messages were addressed to V. Hontarieva, Head, The National Bank of Ukraine and S. Kaplin (MP) both received 67% of such expressions; 60% of them went to H. Trukhanov, Mayor of Odesa; M. Saakashvili, “Movement for New Power”, Leader and U. Suprun, acting Minister of Healthcare received 50% of critical evaluation each. In the first week of February, AUP observed that V. Groysman received the most share of direct speech – 544 seconds that makes 9% of all direct speech provided to Ukraine’s politicians. 420 seconds of direct speech were given to O. Liashko (MP), Radical Party, Leader and V. Novynskyi (MP) got 395 seconds of direct speech. So, 7% out of all direct speech was devoted to both of them. 6% of direct speech went to each of the following politicians: S. Taruta, famous politician; K.Yeliseev, Ambassador Extraordinary and Plenipotentiary of Ukraine and B. Kolesnikov (MP). Political parties. According to the AUP’s monitoring of February, 2018, leaders of attention to political organizations among Ukrainian TV channels became such political parties: the “Opposition Block” that received 5% of news airtime; the “National Front” and the “Radical Party of O. Liashko” with 4% of attention to each one. The Opposition Block was most positively covered in 5% of news broadcast time; whereas the Government was most negatively featured in 1% of news. Politics. AUP’s monitoring in the first week of February, 2018 introduced that the percentage of political topics covered in news by Ukrainian TV channels decreased to 26% from 33% according to data collected in September, 2018; whereas 40% of airtime was dedicated to political news in February, 2017. Inter provided the most broadcast time to political news, 33% of all the topics, whereas UA: The First featured less than all, 20% of news on this topic. According to the AUP’s monitoring of February, 2018, political parties, political personalities and political institutions constituted 19%, 36% and 78% of news coverage, respectively. Ukrainian news broadcasts focused most coverage on national security, defense and law enforcement agencies – 33% of news airtime; the topics of trial and judicial system received 17% of coverage; and 15% of news broadcast was devoted to municipal authorities. The most of negative and skeptical coverage was referred to local government bodies and judicial system, 21% and 20% of coverage, respectively. Inter was most critical of political and governance institutions, according to the AUP, as 22% of its coverage cast a negative light on the mentioned structures. TV News Topics. The most frequently mentioned news topics, according to the AUP’s monitoring, and the percentages of their coverage on TV are given below. Reporting on domestic policy and government authorities were provided in 14% of TV broadcasts. Crime stories had 14% of coverage. Stories of war in the Donbas received 11% of television broadcast news airtime. 6% of television news airtime was devoted to countering the corruption in Ukraine as both a lead and secondary story. UA: The First and Inter devoted the most news airtime – 17% and 16% respectively to the topic of countering the corruption. Channel 5 led all television channels in covering the Donbas war providing 20% of news broadcast time to this topic. Coverage of Ukraine’s armed forces received the most attention of TV channels – in 12% of coverage. 7% of attention was addressed to the State and governmental structures that means level decrease comparing to the previous year as in September, 2017 it was 8%; in May, 2017 – 13%; and in February, 2017 – 33%. Russia and its government received 8% of attention that is less than 11% in September, 2017 and 14% in May and February, 2017. The Normandy peace negotiation format remains in its infancy having only 0,4% of coverage addressed. 3 % of television broadcast news in Ukraine was devoted to Minsk peace agreements. The attention of TV channels to the initiative on bringing the UN peacekeepers to Donbas was discussed on the level of 1%. Television broadcast news focus was placed on four main events, according to the AUP’s monitoring held in February 2018: 1. Crime, automobile accidents and fires (11%); 2. culture and sport (7%); 3. shelling in the Donbas and its consequences (5%) and 4. reportages from the frontline (3,4%). Among political events, the “Law on Institute of National Remembrance” adopted by the Polish Sejm received 5,5% of news broadcast time, and 3,6% was devoted to the “Law of Verkhovna Rada on Anti-Corruption Court”. This research was conducted due to the support of the American people given by the U.S. Agency for International Development (USAID) and Internews Network. 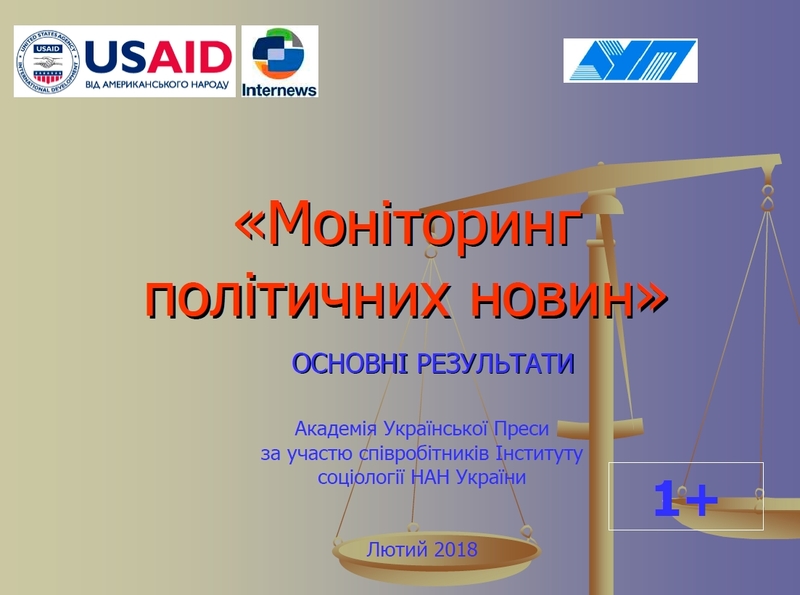 The contents expressed in the materials are the responsibility of the Academy of Ukrainian Press and do not necessarily reflect the views of USAID, U.S. Government and Internews Network.